Mexico City (Ciudad de México), capital of the country, lies at an altitude of more than 2,200 meters in the Anáhuac Valley, surrounded by mighty mountain ranges. The city's location is breathtaking; two magnificent snow-covered volcanoes, Popocatépetl and Iztaccíhuatl, tower above it at heights of more than 5,000 meters. The city preserves countless reminders of its past, though pre-Columbian art and architecture exist only in isolated fragments and museum reproductions since the Spanish Conquistadors built their new city on the ruins of the old Aztec metropolis of Tenochtitlán. A number of the splendid Baroque churches and palaces built during this early colonial period survive. While Mexico City is big, both in terms of population and area, most of the city's best tourist attractions and popular things to do are in the historic city center (Centro Histórico de la Ciudad), a 15-square-kilometer UNESCO World Heritage Site containing more than 1,400 important buildings from the 16th to 19th centuries. For travelers, this is one of the best places to visit in Mexico as examples of the city's Aztec origins and its Spanish colonization can all be enjoyed on foot. The beating heart of Mexico City is Zócalo - the Plaza de la Constitución (Constitution Square) - where the country's first constitution was proclaimed in 1813. Measuring some 240 meters in each direction, it's one of the world's largest squares and was laid out almost immediately after the conquest of the former Aztec city of Tenochtitlán on which it stands. In the early colonial period, the square served a variety of purposes, including as a bullfighting arena and market, while today, it's used for festivals, parades, and demonstrations. Dominated by three of the city's most visited tourist attractions - the National Palace, the Metropolitan Cathedral, and the Templo Mayor with its Aztec relics - Zócalo is the perfect place to begin exploring this historic city. Hot Tip: A short stroll away from Zócalo, you can view three floors of murals by the famous artist Diego Rivera at the Secretaría de Educación Pública (education ministry). Entry is free. One of the most important of its kind in the world, the National Museum of Anthropology lies in Chapultepec Park and is hard to miss due to the huge monolithic figure marking its entrance. Built in 1964, this strikingly successful example of contemporary architecture is famous for its magnificent displays of old Indian art treasures, most notably in the Central Patio, part of which is roofed by a gigantic stone shelter supported by an 11-meter-tall column with waterfalls symbolizing the eternal cycle of life. As spectacular as the building itself is its vast collection, which includes archaeological finds from extinct Indian cultures along with details of the lifestyles of contemporary Indian inhabitants of Mexico. Other highlights include the National Library of Anthropology, founded by Lucas Alaman in 1831 and developed by Emperor Maximilian, which boasts more than 300,000 rare volumes. Despite the widespread destruction after the defeat of the Aztecs, a number of their important historic sites have been unearthed and put on display in recent years. 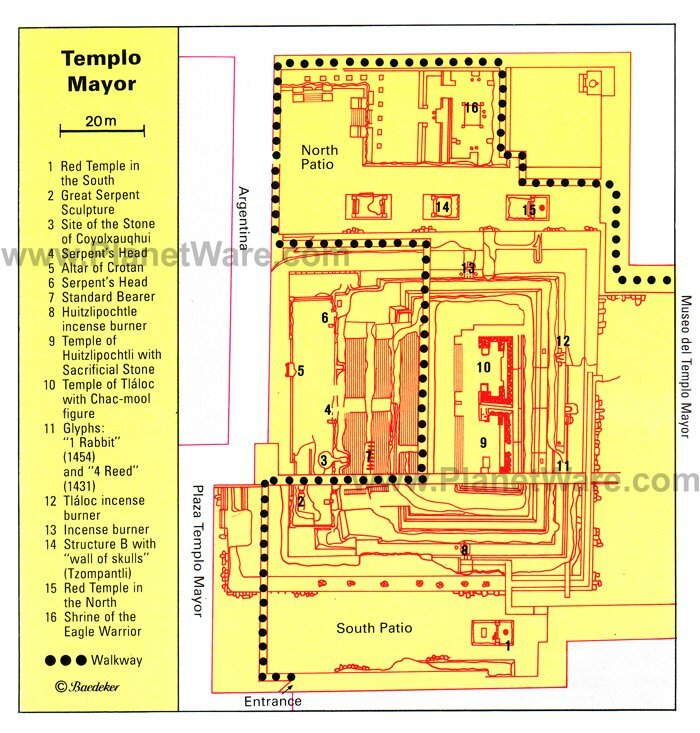 The most important site is Templo Mayor, home to remains of the Great Temple of Tenochtitlán, including the first relic discovered in 1978, a finely sculpted round disc more than three meters in diameter and weighing eight-and-a-half tons. Further excavations - including the summit platform of an earlier pyramid with well-preserved temple walls, along with the skulls of sacrificial victims - indicate the temple site had been built over by the Aztecs and their predecessors 11 times. A highlight of a visit is a walkway past the precinct of the aristocratic "winged warriors," where remains of residences decorated with multi-colored reliefs have been unearthed, along with evidence of the original paintwork. Hot Tip: The vast majority of relics and artifacts uncovered are housed in two museums: the Museum of the Templo Mayor built on the temple site, and the nearby National Museum of Anthropology, widely regarded as the most important museum in Mexico. One of Mexico City's most important cultural landmarks, the Palace of Fine Arts (Palacio de Bellas Artes) is an architectural gem. Towering over the adjacent park, this massive marble building - designed by Italian architect Adamo Boari with Art Nouveau and Art Deco influences - was completed in 1934 and is so heavy that it has sunk more than four meters, despite attempts to lighten it by removing part of its huge dome. The palace serves as an opera house and concert hall hosting a variety of traditional and international dance and operatic productions. But many visitors also come here to view the impressive murals adorning its interior by famous artists such as Diego Rivera, David Alfaro Siqueiros, and José Clemente. On the 4th floor is the Museo Nacional de Arquitectura with rotating exhibits on contemporary architecture. Hot Tip: If you're able to see a performance here, you'll also be rewarded with a chance to enjoy the theater's stunning interior décor, including its spectacular glass-mosaic curtain, made by Tiffany's of New York, depicting the Valley of Mexico and its two mighty volcanoes. Dominating Zócalo square, the massive Mexico City Metropolitan Cathedral (Catedral Metropolitana de la Asunción de María) is one of the oldest and largest churches in the western hemisphere. Built atop part of the old Aztec temple precinct, construction of this massive basalt and grey sandstone structure began in 1525 and extended over 250 years. In spite of the two Neoclassical towers and certain other features, the façade creates a predominantly Baroque impression with its massive twisted columns. Standout features are the bell-towers added in 1793 and the statues of Faith, Hope, and Charity on the clock tower, dating from 1813. The cathedral's interior also shows a mingling of styles, with particular highlights being the richly carved Altar of the Kings (Altar de los Reyes) from 1739, with its superb devotional painting of the Assumption (Asunción de María) to which the cathedral is dedicated. Also of interest are a chapel containing the remains of Mexican Emperor Agustin de Iturbide, and the crypt with its tombs of many of the city's archbishops, among them Juan de Zumárraga, the great teacher of the Indians and the first incumbent of the see. Occupying the east side of Mexico City's main square, Zócalo, the immense National Palace (Palacio Nacional), built of reddish tezontle stone and boasting a 200-meter-long façade, is the official residence of the president. Built on top of an Aztec palace, it was the seat of the Spanish viceroys during the colonial period and has been much altered and enlarged over the years. One of the oldest and finest buildings in the city, it includes such notable features as the Freedom Bell, rung on September 15th, 1810, at the start of the War of Independence (it's rung on the anniversary of this event each year). The palace boasts many handsome rooms laid out around its 14 courtyards, some accessible to visitors, and the most notable being the arcaded Grand Courtyard with its fine frescoes depicting the country's rich history. Don't miss The History of Mexico mural by Diego Rivera, which adorns the grand staircase. English language guided tours explore a museum, a number of large halls, and the parliamentary chamber in which the Reform Constitution of 1857 was drawn up (it and the Constitution of 1917 are on display). Other attractions here are the State Archives, with important historical documents, and the Biblioteca Miguel Lerdo de Tejada, one of the country's largest libraries. Bosque de Chapultepec is Mexico City's principal park, and covering an area of more than four square kilometers, it is also its largest. Once a stronghold of the Toltecs, it was here in AD 1200 that the Aztecs settled, and according to legend, laid out a park in the early 15th century. Over time, the hill became a summer residence of the Aztec rulers with water from its springs conveyed to the temple precinct in the capital by means of an aqueduct, the remains of which can still be seen in Avenida Chapultepec. Portraits of the Aztec rulers were carved on the slopes of the hill, remnants of which can still be seen. These days, the park is popular for its lakes, sports facilities, botanic garden, and museums - you'll find both the National History Museum and the National Museum of Anthropology here - along with numerous fun events, including concerts and theatrical performances. Also of interest are the Museum of Modern Art (Museo de Arte Moderno), opened in 1964 and important for its retrospective look at Mexican art before and during the colonial period and its collection of pictures and sculpture by Mexican artists of the 19th and 20th centuries. The Chapultepec Zoo is also here with a surprising diversity of animals from around the world. The principal east-west traffic artery of Mexico City, Paseo de la Reforma extends for 15 kilometers from Tlatelolco to the residential district of Las Lomas but is best known for the stretch from Avenida Benito Juárez to Chapultepec Park. Here, this attractive boulevard widens to 60 meters with a pleasant green strip in the middle containing busts and monuments to numerous national heroes. While now largely known as a busy entertainment and shopping area, this magnificent avenue - laid out during the reign of Emperor Maximilian - is home to a number of important attractions, most notably the massive Independence Monument (Monumento a la Independencia), also known as "El Angel" for the figure of a winged goddess of victory standing atop its tall 36-meter column. In addition to its fine statues of the heroes of the country's independence movement is the Mausoleum, with its many skulls of some of the country's most important historical figures. Another of Mexico City's world-class attractions is the National History Museum (Museo Nacional de Historia). Housed in the 18th-century Chapultepec Castle (Castillo de Chapultepec), on a site once occupied by Aztec buildings and later by a Spanish hermitage, the museum opened in 1944 and is home to an impressive collection of pre-Columbian material and reproductions of old manuscripts, as well as a vast range of exhibits illustrating the history of Mexico since the Spanish conquest. Highlights include arms and armor, documents, maps, and plans of the Conquest period and its immediate aftermath; ceramics, clothing, jewelry, and coins from three centuries; relics and souvenirs of the struggle for independence and the revolutionary wars; portraits of leading figures in Mexican history; and a number of state carriages, including those used by Benito Juárez and Emperor Maximilian. Also of interest are the apartments occupied by Maximilian and Charlotte, decorated in Neoclassical style and containing furniture brought from Europe. The castle also offers beautiful views over the city. Laced with atmospheric cobblestone streets, Coyoacán is one of Mexico City's oldest neighborhoods. Take time to stroll around the maze of laneways here and explore the hidden plazas, colonial-style mansions, and art-filled old churches like San Juan Bautista. You can also sample exotic fruits and vegetables at the markets. One of the top tourist attractions in the town is the Frida Kahlo Museum in La Casa Azul (The Blue House), where the famous Mexican artist was born and where she frequently returned throughout her life. Here, you can view some of her most important paintings, as well as works by her famous husband, the mural artist Diego Rivera, and personal items from the couple's life. Note that it's best to purchase tickets in advance. An easy way to see all the highlights of Coyoacán is on the full-day Mexico City Super Saver Tour. This 11-hour excursion begins with a guided tour through the neighborhood, including a visit to the Frida Kahlo Museum and North America's oldest university, as well as a boat tour along the canals of the UNESCO-listed ecological reserve, Xochimilco. Said to have attracted its first pilgrims when it opened in 1531, the Roman Catholic Basilica of Our Lady of Guadalupe (Basílica de Nuestra Señora de Guadalupe) attracts millions of visitors and worshipers each year, particularly during the Feast Day each December 12th. Built adjacent to the hill where the Virgin Mary is said to have appeared, the site consists of a complex of buildings overlooking a broad public square adorned with a number of interesting modern sculptures, including a large concrete cross with a unique clock and chime. 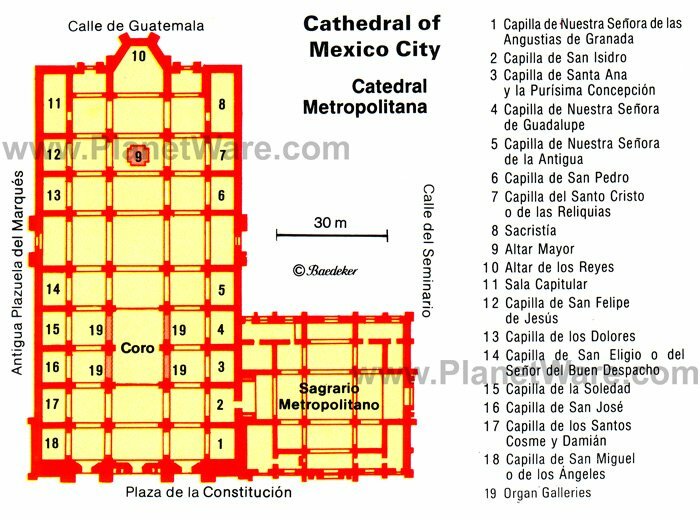 Highlights include a splendid altarpiece dedicated to Mary in the 16th-century Old Basilica, and the new Basilica de Guadalupe, built in 1976, and notable for its distinctive modern curved appearance. 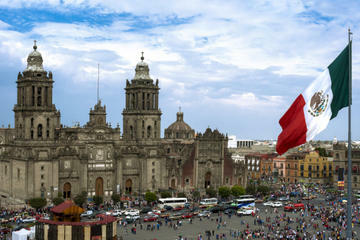 Another of Mexico City's important historic squares is the Square of the Three Cultures (Plaza de las Tres Culturas). The square occupies the site of the main square of the Pre-Columbian town of Tlatelolco and the scene of the last desperate stand by the Aztecs in 1521 - an event remembered by a memorial tablet. It takes its name from its interesting mix of buildings from three different periods: Aztec pyramids and temples, a Spanish church, and modern tower blocks. In addition to the principal pyramid, other Aztec remains include a number of smaller pyramids, platforms, staircases, walls, and altars, as well as a "tzompantli," a wall of skulls and fine reliefs of Aztec calendar signs. The square is also home to a rather sobering memorial museum, Memorial 68, commemorating the tragic murder of some 250 protesting students by government forces in 1968. Also of note is the Baroque church of Santiago de Tlatelolco, built in the early 17th century on the site of a small chapel from 1535 that belonged to the Franciscan convent of Santiago. Adjoining the church is one of the old convent buildings, formerly the Colegio Imperial de Santa Cruz, in which the Franciscans taught the gifted sons of the Aztec nobility (one of the most notable teachers was Bernardino de Sahagún, the great chronicler of the history of New Spain). Opposite the picturesque Church of San Francisco is the spectacular House of Tiles (Casa de los Azulejos). It was originally built in 1596 and boasts a façade decorated by the Conde del Valle de Orizaba 150 years later, with exquisite blue and white tiles from Puebla. It became even more famous after artist José Clemente Orozco painted murals on the walls of the staircase in 1925. The House of Tiles is now a restaurant and an evocative venue to dine al fresco in the building's spectacular courtyard, surrounded by what is one very large work of art. Hot Tip: Be sure to check out the large photo marking the spot where Emiliano Zapata and Pancho Villa dined together on arrival in Mexico City. A short walk from the National Museum of Anthropology is Museo Rufino Tamayo, named after Rufino Tamayo (1900-91), one of Mexico's most famous painters. Notable for its unusual interior, the gallery opened in 1981 and, in addition to Tamayo's artwork it also displays his own extensive collection of several hundred works by contemporary artists, including prints, paintings, sculptures, and wall hangings. Another important art facility worth visiting is Museo Mural Diego Rivera named after one of the country's leading artists whose most famous painting, Dream of a Sunday Afternoon in Alameda Park, in which he caricatured some of Mexico's historical figures, is on display here after years of being banned by the state (Rivera had originally called it Dios no existe, or God does not exist). Luxury Hotels: If you like grand historic hotels, the Gran Hotel Ciudad de Mexico in the Centro Histórico has affordable rates and an unbeatable location, within walking distance of the major historical attractions and with a rooftop terrace overlooking the Zócalo. A dazzling stained-glass ceiling caps the elegant lobby. In the quieter Polanco neighborhood, a short stroll from Chapultepec Park, JW Marriott Hotel Mexico City features a full-service spa and outdoor pool. Near Polanco and just a short walk to the Chapultepec Castle, the St. Regis overlooks Paseo de la Reforma and occupies a sleek modern building with contemporary decor to match. Mid-Range Hotels: A ten-minute walk to Zócalo, near restaurants and shops, the boutique Historico Central, in a beautifully restored 18th-century building, blends history with modern decor and thoughtful added touches such as artisan soaps. Also in a historic building is the Hampton Inn & Suites Mexico City - Centro Historico, featuring a gorgeous stained-glass ceiling. 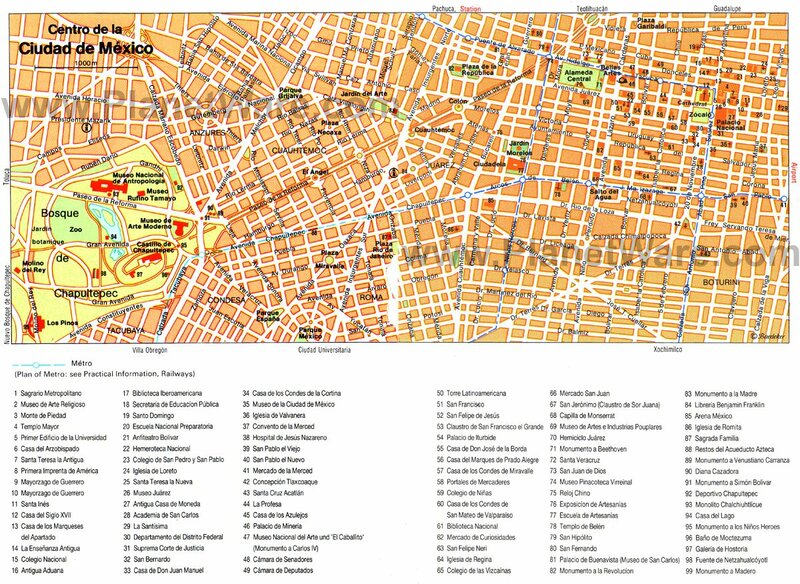 It lies within walking distance to the Zócalo, Alameda Cathedral, and the Palacio de Bellas Artes. The name says it all when it comes to location at the Zocalo Central, in an elegant building dating from the late 19th century. Some rooms score a bird's-eye view over this famous square. Budget Hotels: Near the Palacio de Bellas Artes, a 20-minute walk from the Centro Histórico, the good-value One Ciudad De Mexico Alameda has clean, compact rooms and a free breakfast. A few blocks from Paseo de la Reforma, Hotel Bristol is popular for its friendly service and comfortable rooms, while the modern City Express Plus Reforma El Angel is a short cab ride away from the historical center. Taking an organized tour is the best way to see Mexico City's top attractions, and a convenient way to enjoy day trips to surrounding sites. Guided tours save you time navigating the city's traffic-clogged streets, plus you can learn about the history and culture of the city. These sightseeing tours all include expert guides, entrance fees, and roundtrip transportation. City Sightseeing Tour: Visit some of the city's most iconic sites on the six-hour Mexico City Sightseeing Tour. Explore the immense and imposing Metropolitan Cathedral; see the impressive National Palace; and view the Aztec Calendar Stone at the Anthropological Museum. You'll also have a chance to wander at leisure through Chapultepec, a more than 2,000-acre city park with museums, attractions, and botanical gardens. Hotel pickup and drop-off is also included from most centrally located hotels. Coyoacán, National University and Frida Kahlo Museum: Mexico City's art, history, and nature are covered on the full-day Mexico City Super Saver Tour. This 11-hour excursion begins with a tour through the cobblestone streets of the evocative colonial city of Coyoacán, including a visit to the Frida Kahlo Museum and National University. Top off your city sightseeing adventure with a relaxing boat tour along the canals of the UNESCO-listed ecological reserve Xochimilco. 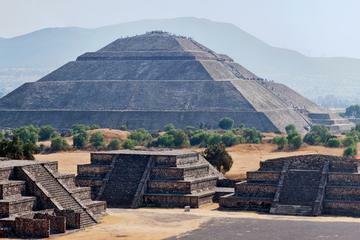 Teotihuacan Pyramids: On the eight-hour Early Morning Teotihuacan Pyramids Tour, you'll be one of the first visitors to gain access to this UNESCO-listed archaeological park. Better still, a private archaeologist guides you through the top sites, including the Palace of Quetzalpapalotl, Sun Pyramid, and Moon Pyramid. After exploring these ancient temples, the tour takes you to an obsidian workshop to see local artisans at work. Iztaccihuatl Volcano: Avid hikers can enjoy spectacular views of Popocatepetl and the Valley of Mexico on the Iztaccihuatl Volcano Hiking Tour from Mexico City. This 12-hour tour includes a hike up the intermediate trail of this dormant volcano, stopping short of the 5,230-meter summit to admire the panorama.